This Is Getting Old: Kings of Pennsylvania! Sidney Crosby fueled the Pens with 3 assists to a 4-1 win against the Philadelphia Flyers that was important for a multitude of reasons. First, they defeated their cross-state rivals yet again to take the season series 5-1 and cement themselves as regular season "Kings of PA". Second, it gave them two important points to stay tied with the New Jersey Devils for the division lead. And third, but certainly not least, they clinched a spot in the playoffs with 7 games remaining in the regular season. 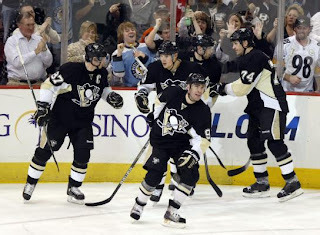 This was truly a team effort from the Pens, and just about every player played their part in the victory. They did have a slow first period, giving up a fluky "slow motion" goal to Arron Asham little over 1 minute into the game. Philadelphia would then control the next 10 or so minutes, but it would be the last time they controlled the game. The Pens got the momentum started when Chris Kunitz scored on a Jordan Leopold rebound with 58 seconds to go in the first period. Also, Marc-Andre Fleury got an assist on that goal, giving him his first offensive point of the season. Sidney Crosby then got things started 6:03 into the second by leading a breakaway and throwing a wrister on Flyers' goalie Backlund. Backlund made the original save but Pascal Dupuis was there to poke home the rebound for his 18th goal of the season and a 2-1 lead for the Pens. The third period was even more eventful, featuring more of a Pens-Flyers atmosphere with 7 minor penalties, compared to the 4 in the previous 2 periods combined. The Pens also extended their lead when Matt Cooke took a pass from Ruslan Fedotenko in front and gave Pittsburgh a 3-1 lead. Fedotenko was still not done though and scored a powerplay goal of his own on a pass from Sidney Crosby to put the Pens up by 3 with less than 6 minutes remaining. The Pens did all this without star forward Evgeni Malkin, who missed his 5th game out of 6 with a foot injury and powerplay captain Sergei Gonchar who missed his second straight due to illness. It is unknown when either will officially return, although footage of Malkin skating in practice was shown. As mentioned above, the Penguins clinched a place in the Eastern Conference playoffs, joining the Capitals, Devils, and Sabres as the teams that clinched in. Coach Dan Bylsma mentioned in the postgame press conference that the Penguins will continue to work hard in the remaining 7 games, but "you always want to have the x by your name," referring to the way teams that have clinched the playoffs get a small x to the left of their name on the standings sheet. For the Flyers, it was a polar opposite reaction as they fell to eighth spot only 2 points ahead of the ninth place Atlanta Thrashers for the final playoff spot. It also should be noted that, barring a playoff matchup, this was the last game between the Pens and their most hated rivals in Mellon Arena, as they are moving to the Consol Energy Center next season. The Pens next play Sunday afternoon against the Toronto Maple Leafs, in the first matchup between the two teams since the "blockbuster" trade sending Alexei Ponikarovsky to the Pens for WBS prospect Luca Caputi and defenseman Martin Skoula.